THE MACOMBER AFFAIR—-Hemingway’s story “The Short, Happy Life Of Francis Macomber” became one of the first ‘Great White Hunter’ sagas that enjoyed popularity for around a decade (this came out in 1947). Directed by Zoltan Korda, with a script adapted by Casey Robinson, it’s clever, with a goodly amount of bristling dialogue between the three leads. 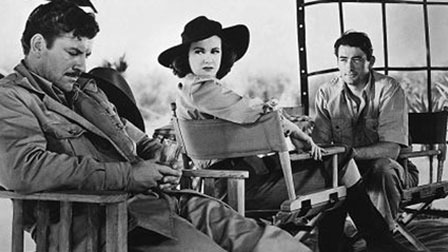 Worldly guide Gregory Peck takes out a safari for rich weakling Robert Preston and his wife, Joan Bennett, whose nose is markedly in the uptilted position. No bones are made about where beds are laid, and the trek into the bush becomes more of a hassle than anticipated. Good acting from the three stars, effective musical scoring from Miklos Rozsa and location shooting are all commendable. 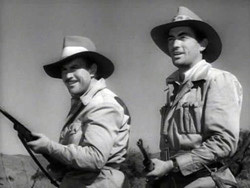 The 2nd-unit footage in Kenya mixes with that done in isolated areas around Tecate, Mexico, used as a substitute for Africa. The script is regarded as one of the best adaptations of Hemingway’s work (the story was written in 1936), though the ending was softened to conform to production code restrictions. A brisk 89 minutes, co-starring Reginald Denny. Box-office was around $2,500,000. For Peck, it was a satisfying personal and professional experience, though the little picture was rather lost, sandwiched between his huge hits Spellbound and The Yearling, then Duel In The Sun and Gentleman’s Agreement. As the venomous wife, Bennett, 36, added another winner to her gallery of femme fatale parts spicing that phase of her career. Preston, who had been out of circulation since going into the Air Corps in 1943, drew the best reviews; the attention sparked a fresh spate of good roles.